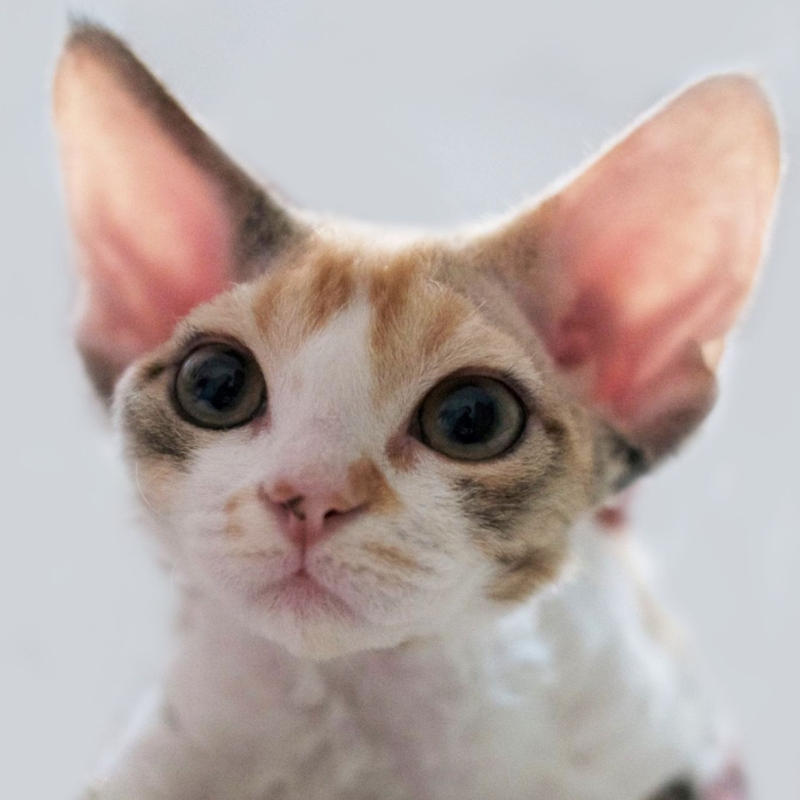 Just Dudosław – tenderly Dudi – one of a kind, unique, and absolutely perfect Devon Rex, who after 3-month socialisation in LokiMiao breeding cattery (Breeder: Mrs. & Mr. Pietrzok) as a 100% Devon meeting criteria of a perfect cat worked his way into my arms and heart! 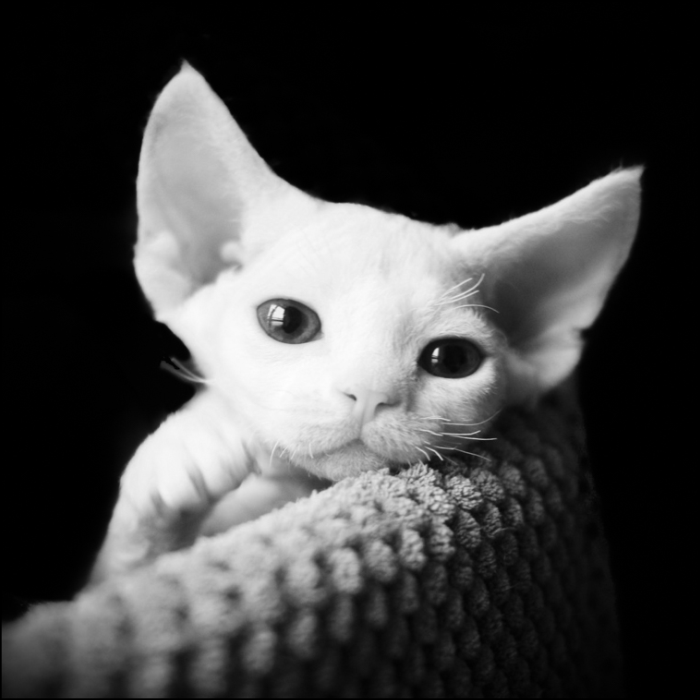 The more you have, the more you want… it is the only answer to the question: “Why do you need a second male cat if you already have Django Loki-Miao*PL” ? Yes. That’s true. Django has a beautiful profile and his eyes are amazing! His profile is exactly the one I love: extremely large forehead and a short muzzle – the right size, without any peculiarities. All these features are passed on to his children… his personality is awesoooome! No territory marking! I browsed all available sources, saw hundreds of photos and bloodlines, and it turned out that all roads lead me and my dreams to Germany – a country most beloved by me by reason of my profession. This journey took me to another well-established breeding… FLORENTINO. Now, I am a lucky owner of a beautiful chocolate male cat – RINGO STAR, courtesy of sweetheart CHRISTA. I do not intend to write at length on his genotype in the strict sense as this breeding line needs no introduction for those who are familiar with it, however, I do want to emphasise their incredible personality – a lovely nature that everyone is entranced by. I wish you all get such a wonderful DEVON. Sooner or later further breed development became necessary… I always used to dream about a little white Devon from a recognized foreign breed. That is why I made the final decision so rapidly!!! 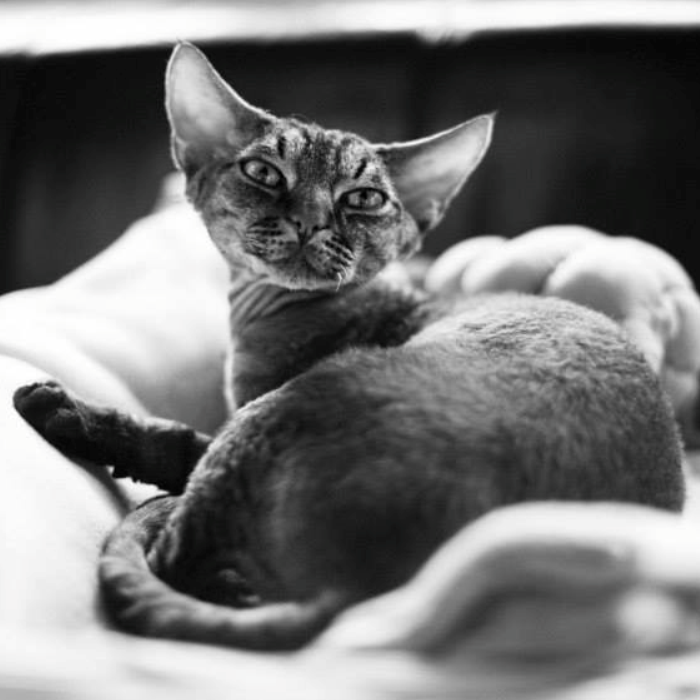 At the end of July Dudoland was joined by a new green-eyed girl kitten – JAKARTA. Her beautiful fur has ideal colour and type. Helenka Dudoland * Pl is the result of our breeding efforts for the last 3 years. Green-eyed and snow-white girl from Litter H – the daughter of IC Jakarta and Django. Genetic tests confirmed chocolate gene traits in her, which may turn out to be additional advantage in combination with our striped chocolate boy GIC Florentino’s Ringo Star. Like all our white cats she had a BAER test which confirmed bilateral hearing. a beautiful high forehead after Loki Miao breeding line. Her mommy IC Jakarta gave Helenka a noble dense snow-white fur and a wonderful profile. 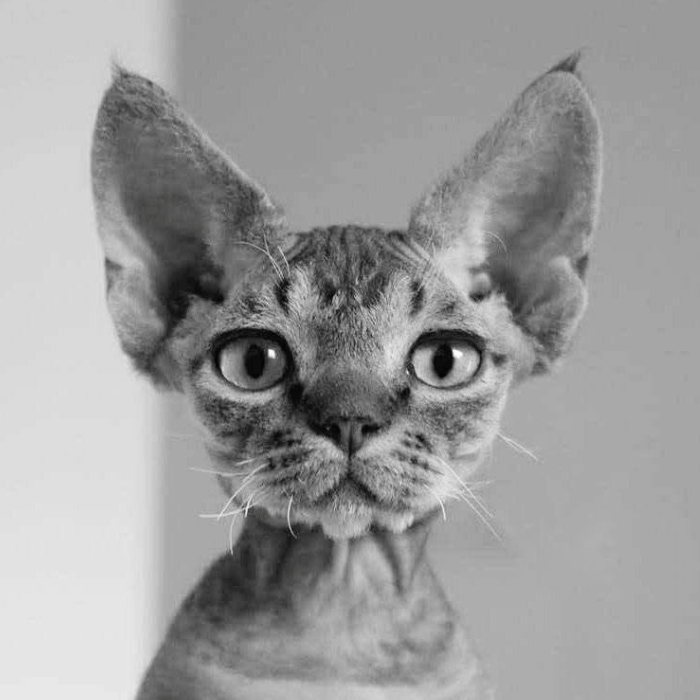 The girl cat also has a unique temper – it is a great success and joy for us. 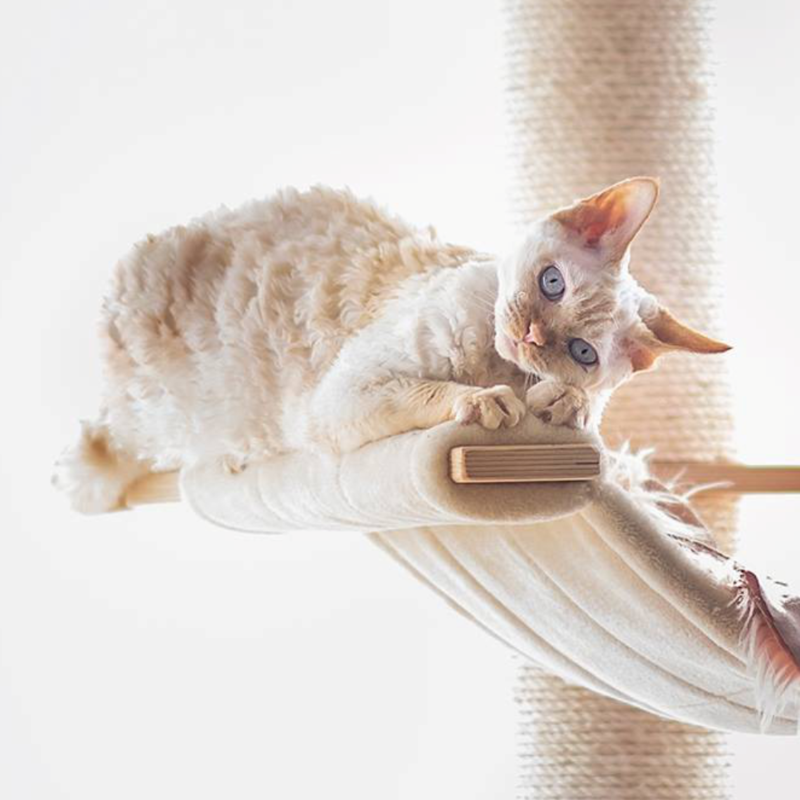 It is a huge distinction for our breeding, the more so that that there were plenty of lovely and titled white adult competitor cats! We appreciate very much each judge’s vote! We are happy to introduce (N) Santala’s YAYA ❤– a wonderful black pearl and a little prima ballerina admired by the way she behaves. Magical, extremely delicate, sensitive, conflict-free, and tender but also very curious about the world. 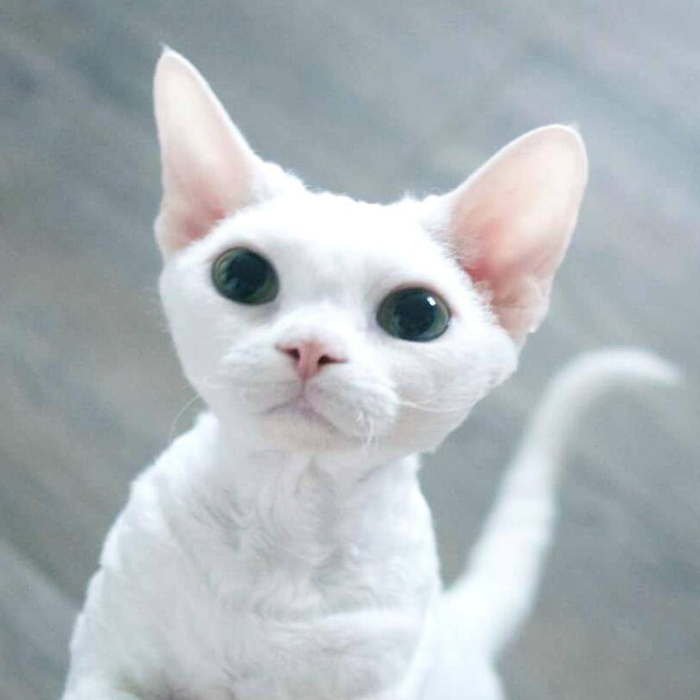 This girl cat has brought what we particularly value in this breed – namely extremely large eyes that occupy a significant part of her short mouth. Her head and ears are also fantastic! They are the ones that I dreamed about days and nights. Now, she started to grow her noble fur which is very promising. (N) Santala’s Yaya also has ideal body proportions that we have always cared about in our breeding work – long legs and a fantastic swan-like neck ; ) Yeah! We do admire your consistent support, both at the time we waited for this dreamy girl and now. Thank you for staying in contact and providing us with plenty of positive energy, enthusiasm and love! We were lucky to accompany our new girl in the first days and weeks of her life. She has been and still is admired by the colour first which is actually the one we have always dreamed about, but over time, everyone notices a wonderful type and personality. We had a very good start into the new year. Our feline family has been joined by a frisky little cat named Victoria. 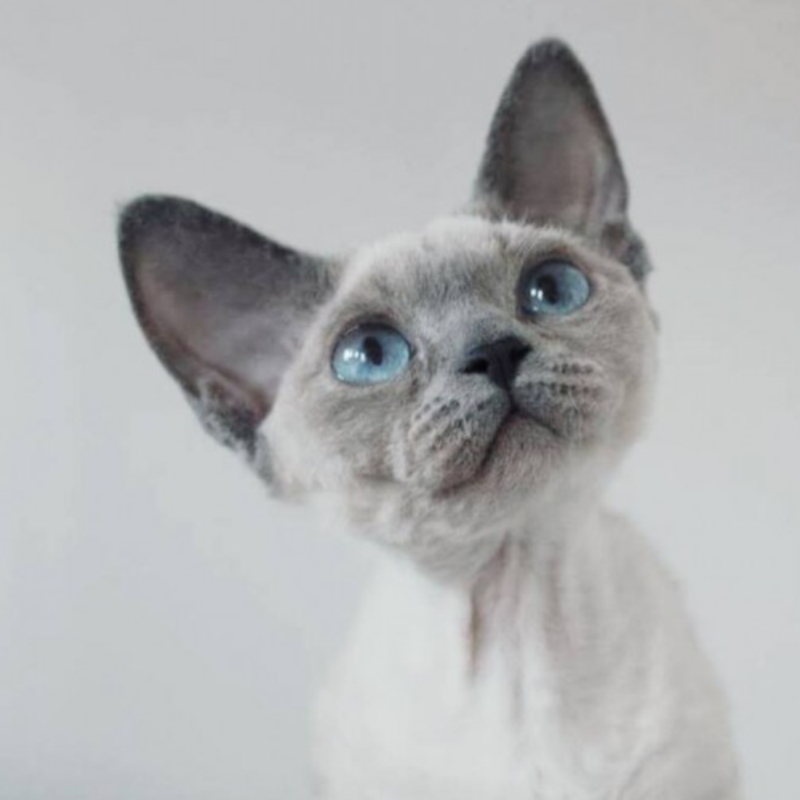 This blue point girl cat with forget-me-not eyes made my dreams come true ! One cannot avoid being astonished by the beauty and density of her coat… looking exactly as I expected it to look. 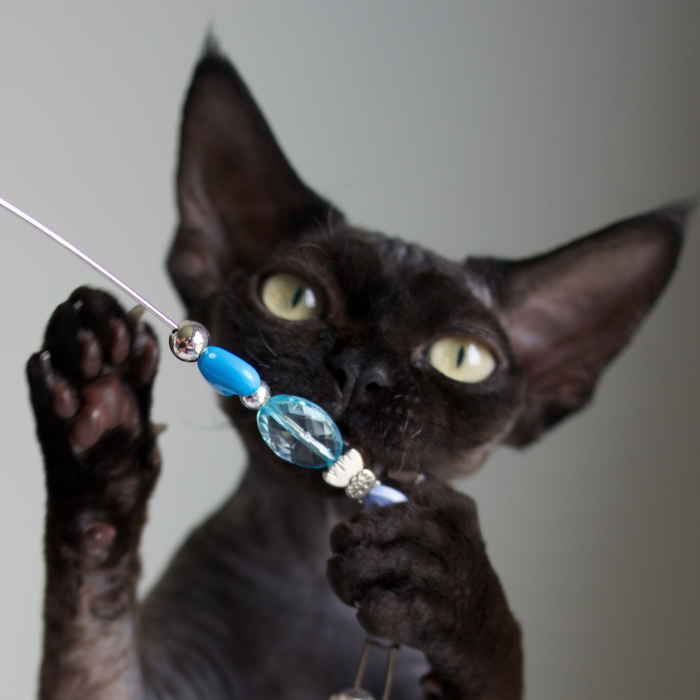 Her family tree evidences exceptional bloodlines of the best US and Russian breeds. Victoria is a little clingy; she would prefer cuddle sessions throughout the day. She is very playful, friendly and courageous. She adapted to her new Dudoland family and made friends with other cats very quickly. A strong team spirit is a great joy for the breeder ! We are happy to have her with us and we hope she is happy with us, too. During a 3-month casting period our sterilized Natasza found her new crazy family already having a sterilized Bengal cat to share time together. The two cats fit in each other’s company and make a team that is good enough to steal donuts! She has found a loving home with wonderful people and a new cat friend Sumisia. Ewunia, I thank you wholeheartedly for everything!